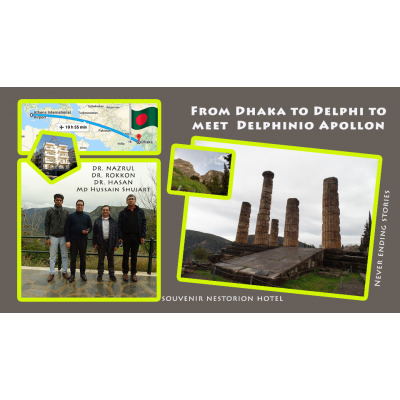 A better description than this of an "old" blue guide could not be better in order to talk about Delphi. Opportunity given to us by 4 visitors from Bangladesh. 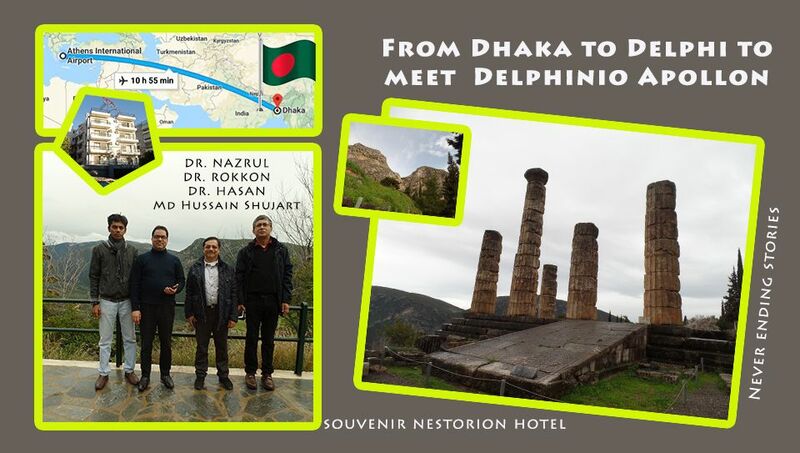 We quickly covered the communication distance Athens - Dhaka, in one body - travel - spirit - and we drove in a few hours to the temple of Pythian Apollo! "This holly center of the ancient Greek spirit is one of the most impressive places you will ever meet, wherever you travel. Its religious and intellectual radiance was famous throughout the Greek world: he had even reached Central Asia.It is not strange, at least since Homer's time, that the Greeks considered the Delphic sanctuary, where Zeus spoke with the voice of Apollo as the navel of the earth in the Greek-Bavarian kingdom founded by Alexander the Great. Thoughts let's take on the mythical destiny of the Delphic oracle will become even deeper when you look at the marvelous background chosen by the ancient Greeks to build the sanctuary. As you look at it from the road of Arachova hung on the slope of Parnassus, the imposing mountains of Greece, the temple of Apollo gives at the same time the measure of human weakness and its grandeur. Delphi was chosen by the Council of Europe to establish the European Spiritual Center, council the raising of philosophical or political. See Wikipedia. Stories about the "crime of the young god" for the "liberation of the oracle" for the "organization of the Delphic Force" for the "Amphiction Conference" First International Fundraising "for" Apollo that is ecstatic "for the sacred war" for "the Age of Invasion of the Oracle" for "Orthodoxy's decline" and "Excavations" you should refer to a serious library or click on the Internet to learn more. Do not forget to look at the delphi poet Sikelianos and his wife Eve to see the apotheosis of influence ... because Delphi would like the time a university to understand! But if Apollo "lived" today what could we say to him? Here's a little hymn to his honor! Apollo, lord of the imposing landscape ..
One day you crumbled the space by killing Python. Together with ambitious sailors later priests ..
Delphine Apollo, Cretan, purified, shining god ..
New master of the Oracle, Pythian Apollo ..
Oh! Apollo Liberator and Punisher of the Crisis .. Your price is the colorful donations of Gigis and Lydia! Great thanks to the thesaurus of the Athenians. Your eternal believers and servants are saints, priests and youths. Free interpreters, virgins and sacred slaves ..
Rectors, ambiguous and sacred administrators .. Your attention is strong, you guard the treasures. City-state feeder, rulers, merchants and pilgrims. Parasites are prey with rapacity, laziness and ..
To You great Apollo God we believe and worship.